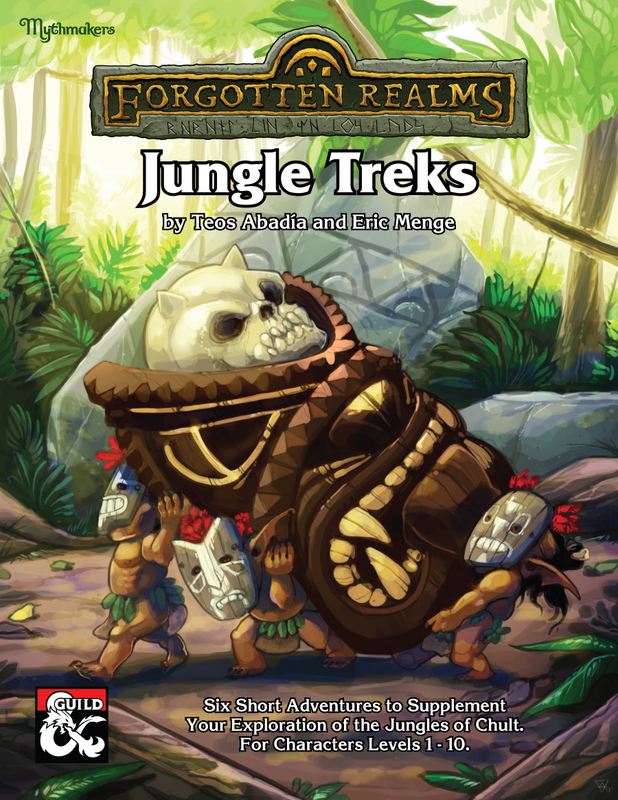 I’ve partnered with one of my favorite authors of all time, Eric Menge, to bring you a super-useful adventure supplement: Jungle Treks! We wrote six adventures to supplement jungle exploration in Tomb of Annihilation or similar wilderness campaigns. Our motivation was to bring some really great moments to your gaming table, while adding great utility for DMs. The supplement has actually proven invaluable at my own gaming table. On multiple occasions the players have made unexpected choices… and Jungle Treks came to the rescue. I want to, of course, talk about Jungle Treks and why you will enjoy it and benefit from it. Jungle Treks has in its first two days had five 5-Star reviews, been the #2 “most popular,” and become the #6 “hottest” title on the DMs Guild! It became a Copper Best Seller on day 3! We are so thankful for your support, because as I mentioned in What is an Adventure Worth, authors just never know if the hard work will pay off. I also want to talk about exploration in Tomb of Annihilation and how it creates both advantages and challenges for a DM. First, let’s talk about what Eric and I created! The supplement is a collection of six short adventures, each of which can be dropped into Tomb of Annihilation (ToA). Each adventure features interesting challenges highlighting the dangers of the jungle and allowing players to engage with aspects of Chult. Tavern Trouble – With a mysterious curse upon your guide, escaping lizards, and foes who have come to settle debts, your jungle trek gets interesting before you even leave the tavern! If Looks Could Kill – Crossing paths with a merchant prince’s expedition can be very lucrative. The expedition members’ agendas present interesting choices, as do the dangerous denizens of the swamp. Ambush from Above – Grung acrobats? With a team mascot? What is going on here? Mystic River – Traveling downriver suddenly comes alive with dangerous white water, carnivorous plants, a brontosaurus’ tail… and an unusual spectator! Mudslide – It’s been raining for days, and that rumble isn’t a dinosaur! Run for your lives, and watch the creatures in the mud! Beautiful Plumage – Ancient ruins are now home to beautiful but dangerous singers. A batiri queen demands revenge and her tribe’s totem awakens! Designing these adventures was a ton of fun. Eric Menge was the mastermind behind the plot of one of Living Greyhawk’s most celebrated organized play regions – the Duchy of Geoff. His plot arcs filled with great emotional stories and hard choices are what made me want to start writing adventures. Working with him is always an honor. I was already running ToA when we started creating the adventures, so I knew I wanted the three I designed to both cover interesting aspects of jungle exploration and to provide a memorable experience. As a designer I am always looking for ways to nudge play forward – helping both DMs and players discover new ways to play. By using Jungle Treks, a DM is more likely to learn how to create their own scenarios and players are more likely to think creatively when faced with outdoor challenges. Tavern Trouble is actually the refinement of an idea I had for the D&D Open. When designing the 2017 D&D Open I watched all of the Indiana Jones movies. Remember how Temple of Doom opens with that insane bar scene where Indy wants to trade for a diamond, ends up poisoned, diamond and antidote go flying, crowd goes crazy, ice falls onto the diamond, and bad guys are everywhere? (If you don’t, YouTube to the rescue!) I thought that kind of experience would be really cool for the Open, but it didn’t fit our concept and our need to get straight to the fun temples. As with any engaging idea, I kept working on it and now you have it. The idea is to turn the routine tavern scene (go to the tavern, talk to your guide or contact, hire them) into a really fun scene where you aren’t sure your guide will even survive! The scene can kick off any exploration, including the other adventures in Jungle Treks. I also like that it introduces some neat hooks. The gang and who hired them ended up being very interesting elements in my home campaign, largely due to ideas the players had after the combat! If Looks Could Kill allows the party to meet a large expedition in the jungle. The party could chance across their camp (which can be great if the party badly needs a safe refuge or information) or a merchant prince could hire the party to support the expedition. The expedition NPCs have some great agendas. In classic Eric Menge fashion, the party is presented with difficult choices. And, the monsters are cool and fit the scenario perfectly. Ambush from Above is a simple trail ambush… except the grung have an interesting mascot. Grungs only speak grung, so parties may just treat this as a fun combat (the foes have an interesting mechanic to keep things interesting) or they may parley. When I playtested it, my party nearly wiped them out and then suddenly pulled back, allowing a few to leave. This creates some nice dangling plot opportunities for the DM in the future. I have some great ideas in my own home campaign for how the party may next encounter this crazy grung tribe. 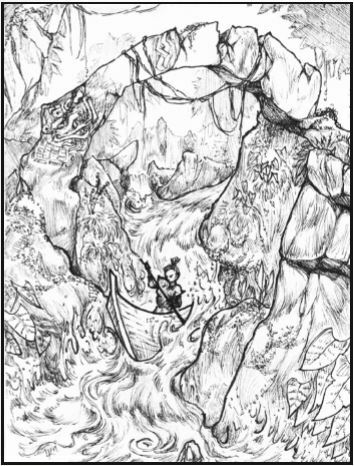 Mystic River is an attempt to showcase how a DM can create a wilderness encounter that has monsters and challenges but isn’t a combat. Each of the challenges encountered as the party travels has elements designed to encourage both players and DM to be creative and add to the story. It’s the kind of adventure I would run slightly differently each time, based on the party. I find such design really educational for me as a DM, helping me improve my ability to adapt. I love how Mudslide takes an aspect of Chult, the weather, and gives it teeth. In my home campaign it was super-fun to emphasize the rain over several days of travel, then suddenly drop in this scene. The players are given many choices, and all of those choices then have different aspects as they learn about the challenge. I just ran Beautiful Plumage this week. One of our PCs is playing a Batiri goblin who left his tribe (Clan Dimetrodon) when another tribe stole Dimetrodon’s totem. I didn’t expect the PCs to go after this plot thread anytime soon. Instead, they announced they were hunting down the totem. Guess what has a batiri totem in it? Beautiful Plumage to the rescue! I love what Eric does with the monsters here, turning their plumage into a truly Chultan variant and creating terrain that develops both tactics and the story. This was one of the longer scenes, taking about two hours due to all the fun interactions our players had with the ruins and finally the combat and resolution. Let’s talk about how ToA presents exploration opportunities and challenges. One of the really neat aspects of DMing Tomb of Annihilation is jungle exploration. The adventurers often have clues to the rough location of an important tomb, creature, or item, but must hire a guide and explore the jungle to find it. ToA even comes with a blank poster map for players to fill in as they explore and rules for navigation! The blank poster map is a nod to the classic adventure X1, The Isle of Dread. 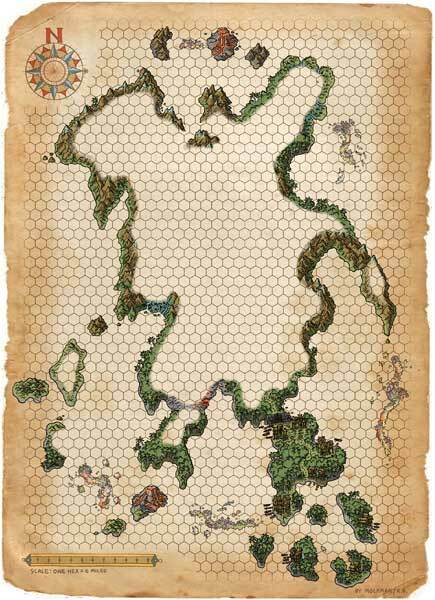 That adventure featured a hex map with the outer borders of the island filled in. It was even redone not too long ago, when the adventure was updated for the D&D Next playtest. ToA‘s map is similar. Most DMs will be really excited about the exploration… until reality strikes. Each hex on the map is 10 miles and in a day the party will cross 0-4 hexes. For most parties without a ranger, it can take many days to get to the desired location. All those days and all those hexes beg for fun. The suggestion in ToA is to roll a d20 three times per day (morning, afternoon, evening/night). On a 16 or higher, a random encounter takes place (with the suggestion of no more than two random encounters per session). An early location to visit is Camp Vengeance, roughly 18 hexes (180 miles) from Port Nyanzaru. That could take a minimum of 5 days, but probably more than 9 days. With three rolls per day… there are many chances for random encounters even for the early plot hooks. Random encounters are a classic aspect of D&D. They can really force us to improvise, and doing so can be a great learning method. On the other hand, modern players and DMs often crave experiences woven into a narrative, or at least something that captures the interesting scenes in novels or movies. ToA is better than most adventures, providing a few sentences for each random encounter. Still, it can be easy to want more than what is provided, and it is hard for DMs to envision how to flesh it out. There has to be something in all those empty hexes, and some of them should have more depth than a chance encounter with some beasts. In Jungle Treks we show how exploration encounters can be larger experiences. Often we manage to do that with just two pages of text, but provide thirty minutes to more than an hour of engagement along with full monster stat blocks and maps. Much of the information is to ensure that we fully support 10 levels of play, and to properly convey the encounter to a varied audience. When you create your own jungle treks, you can do what I did when I was playtesting: a half-page with a bullet point outline. The key is working through how to make the scene engaging for the players. You can contrast this with the approach in ToA. A few sentences or a paragraph spark your imagination, but may not create an engaging scene. For example, the cyclops entry tells you where it is headed and that it won’t necessarily look for a fight… but it also doesn’t provide anything that will cause players to realize there is more here than a fight. I’m a big fan of what Wizards has done here, because it advances random encounters. For my own purposes, I want to flesh them out even further. I highly recommend Encounters in the Jungles of Chult, a set of 10 encounters published by the Guild Adepts. Most of these encounters are one page in length, and do a terrific job of being quick and easy to run while providing engagement. I just picked this up and will be using this in my ToA campaign alongside Jungle Treks. My approach to random encounters is to roll ahead of time. I might roll six times, take three that catch my attention, and flesh them out in outline form. Then I might find a way to randomize that, or just pick them as needed. A fun idea: search the internet for some fun symbols, print them on card-stock (maybe glued to a coin or other object) and toss them in a dice bag, along with other similar chits that are blank. Encounters on a 16+ means 5-out-of-20, so you could plan 3 encounters and include them with 12 blank ones for a 1:4 ratio. Oh, and Skald’s Forge blog did a great job of summarizing the Daily Procedure for exploration. I took the information and made it into a one-page reference sheet for myself. Really helpful! If you are running Tomb of Annihilation or a similar campaign, how is exploration working out for you? How do you keep jungle encounters fresh and interesting? Have any other Guild products been helpful? And, I hope you will consider checking out Jungle Treks! Sean at Power Score RPG has long created absolutely amazing blog posts analyzing the official D&D adventures and providing guides on how best to run them. You can find his blog post on ToA here or pick up his A Guide to Tomb of Annihilation on the Guild! Power Score RPG was kind enough to review Jungle Treks and gave it a huge thumbs up! Thanks! The incredible Merric Blackman reviewed Jungle Treks and highly recommends it. Thank you!! One of my favorite podcasts, Down with D&D, reviewed Jungle Treks and recommend it! They say Eric Menge should be considered for a Guild Adept position in a future season, and I agree! The ID DM had Enrique Bertran (Newbie DM) on his podcast. They talk about Tomb of Annihilation and why it resonates so well, along with why 5E is succeeding. Sly Flourish is such an obviously great read I assume you are already reading Mike’s blog. If not, his piece for DMs on how to use Advantage, Disadvantage, and Inspiration has some fantastic advice. In particular, he hones in on how as DMs we can look for specific triggers that lead us to granting or using those mechanics, which in turn helps us create dramatic action and remember the mechanics. Gnome Stew reviewed Ray Vallese’s Writing with Style: An Editor’s Advice for RPG Writers. I completely agree with Gnome Stew. This is an excellent read that will improve your adventure and RPG writing! Ray is an amazing RPG writer, designer, and developer. He worked extensively on Planescape and other D&D products and often works with the Numenera team. I was honored to have him edit Traveling the Athasian Wastes in Dungeon 202, and he was fantastic to work with! Dyson Logos makes awesome maps, and he has shared more than 150 of them for all kinds of use, including commercial! You can even modify them! I modified his tavern for use in Jungle Treks. Support his Patreon, which in turn supports him releasing more maps! The jungle has proven to be more tedious than fun for me as DM, so far. Maybe I just don’t have enough goodies to fill the void with. Also, my party ported over from SKT, so they’ve been around level 5 since they got to Chult. There hasn’t been a single jungle encounter that has threatened them. I’ve learned a lot about running my own wilderness survival campaign, which is a goal I’ve had my eyes on for a while, so that’s really cool. It’s nice to be able to get a feel for the tools I wish I had. Maybe its a nod to more… classic gamers, who know how to map out of habit, but as a new generation, I’ve not been trained in that aspect of it. Also, its a shame that the dropped ugly blank hexes all over another Mike Schley Masterpiece. I think if they had asked, he could have provided a map that abstracted away all the information, like the way the map of the Lonely mountain did in the hobbit. Make a handout that felt like it was part of the world, not hastily done outside of it. But enough of my rants. Jungle treks is on my wishlist. It looks like a lot of fun! For the hex map, our group adds a dot to the map in each hex as we move. This makes it cool to explore, giving a sense of completion/achievement. The understanding is that entering a hex will reveal what is there (even though it is 10 miles wide). If we find something such as a temple, ruin, or other permanent feature, then we note it. For challenge levels, our party tends to act one level higher. At level 4, level 5 hard encounters work well for them. You might experiment and see if you can find a consistent change like that. The D&D hardback adventures tend to be a very loose challenge rating, with encounters that aren’t necessarily challenging. You might plug the fights into a tool such as Kobold Fight Club and see what the level is, then add more foes until it hits the challenge level your party needs. A simple fix is to just add damage. You can add an extra die (or the average of a die, if you use average damage) to each foe attack. A monster doing 3d8 now does 4d8, or you add 4.5 = 5 points of damage to each attack. That usually is a nice pressure boost that makes combats more challenging. I also like having some spike damage, which can be achieved by giving one monster a bigger boost… maybe adding a recharge attack (or just use it every other round) that does 2 more dice of damage. That spike damage can really wake up a party. Because the hardbacks are built to allow open exploration by parties of varying levels, they are often easier fights. You might figure out the challenge level of the fight (plugging into a tool like Kobold Fight Club can speed up the process) and then ramp it up for your party. Thanks for the interest in Jungle Treks! I hope you enjoy it! This entry was posted on November 2, 2017 by Alphastream and tagged 5E, Authoring, Ecology, Mapless Combat, Overland Travel, Tomb of Annihilation.